And then there were two. . . Yesterday evening The Farmer and I saw a little white “chick-or-keet” when we threw out some feed. The Farmer commented it “looked different.” And it did. The legs didn’t look as long. I thought maybe it was getting more fuzz and/or feathers that just covered up some of the legs. But then this morning I was looking out the window and saw TWO white heads bobbing through the grass in the main pasture. Well duh! 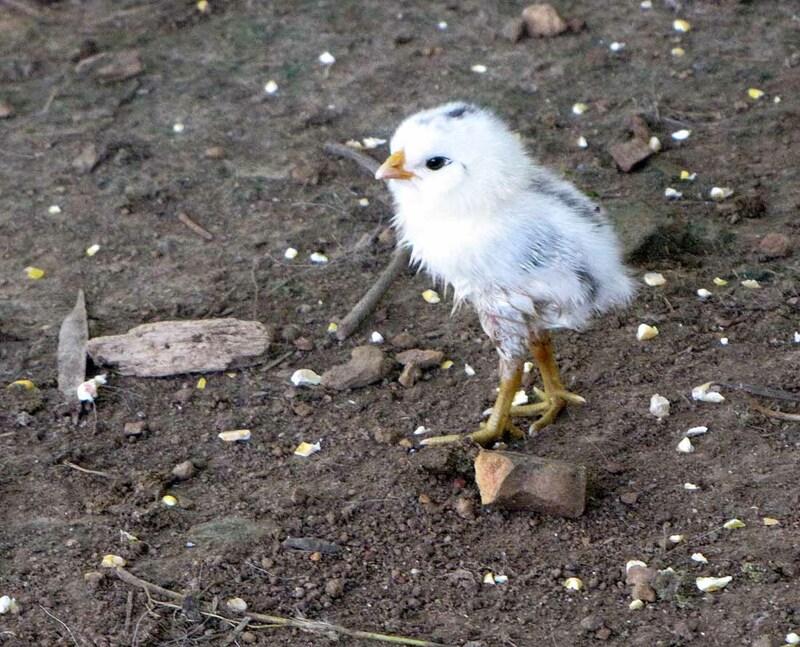 That little keet looked different because it WAS different…. there are at least two of them running around out there! We still have the original “chick-or-keet” that I took another picture of this morning when I went out to feed . 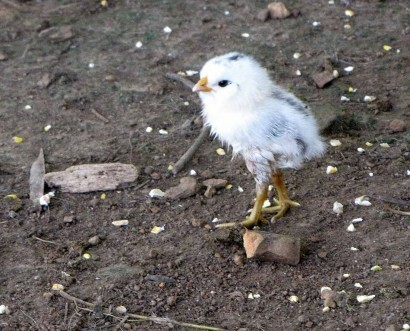 . .
Got to say, it still looks like a baby chick, not a keet. 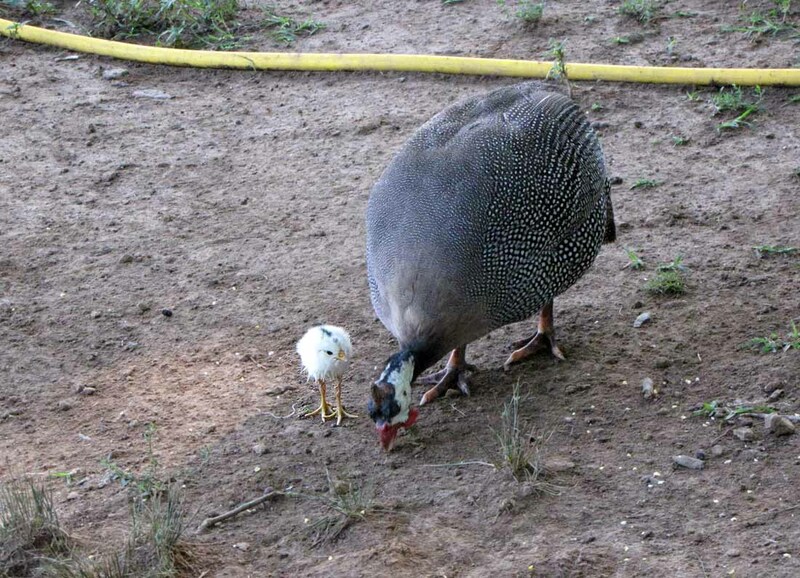 But the mama guinea hen is very protective of this little one, and chases away anyone that gets near. But what about the other little head bobbing out in the pasture? 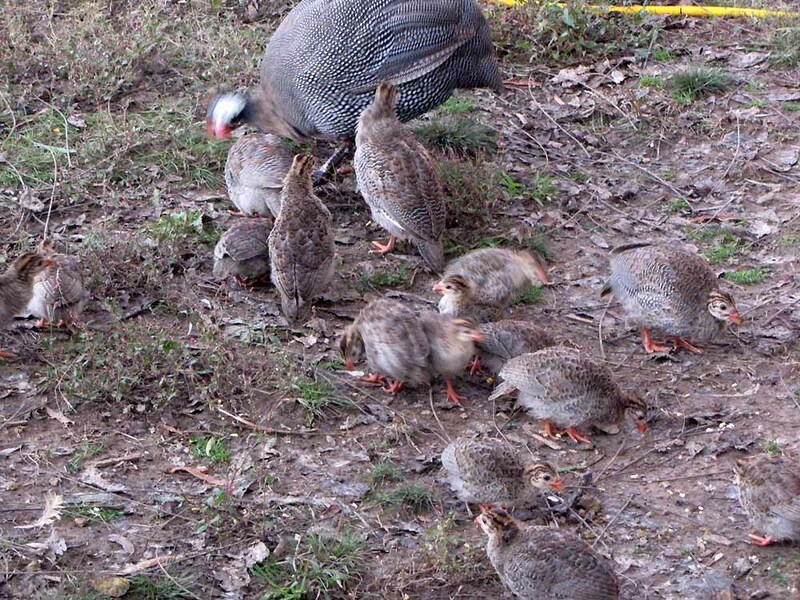 I could see the original elsewhere, and there were some little brown keets with another set of guinea hens. And one pale one. . .
Definitely a second little white head bobbing around in the grass! I couldn’t go out right then to get a closer look, because I was waiting for the Mediacom guys (AGAIN!) to come check on our intermittent service. 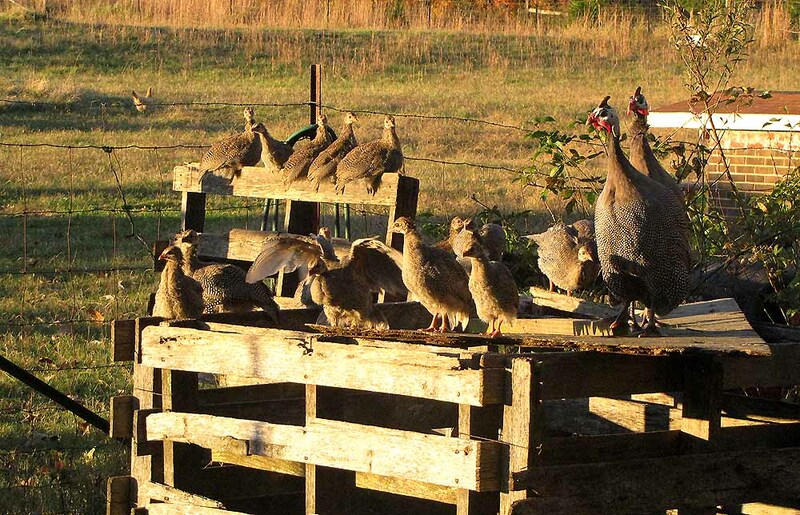 When they had come and gone, I finally got to go out and do morning chores. 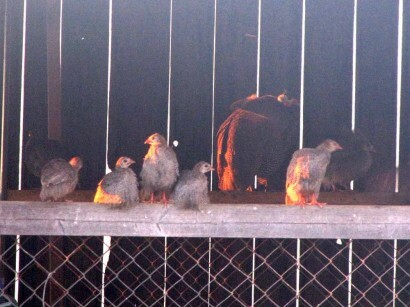 The hens with the new keets didn’t come in to get some grain. I finally found them out in the llamas pen. At first I didn’t see the pale one. There were some little brown ones running after the trio of hens, but no white one. 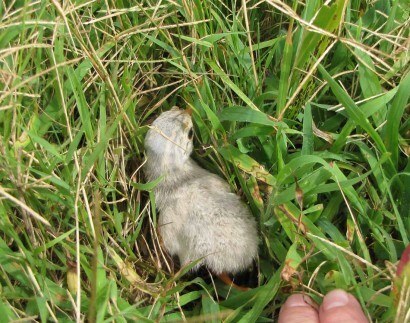 However, I could hear the “peep, peep” of little keets left behind, and homed in on the sound until I found some more in the tall grass, including the white one. Discovered, one little keet in the grass! 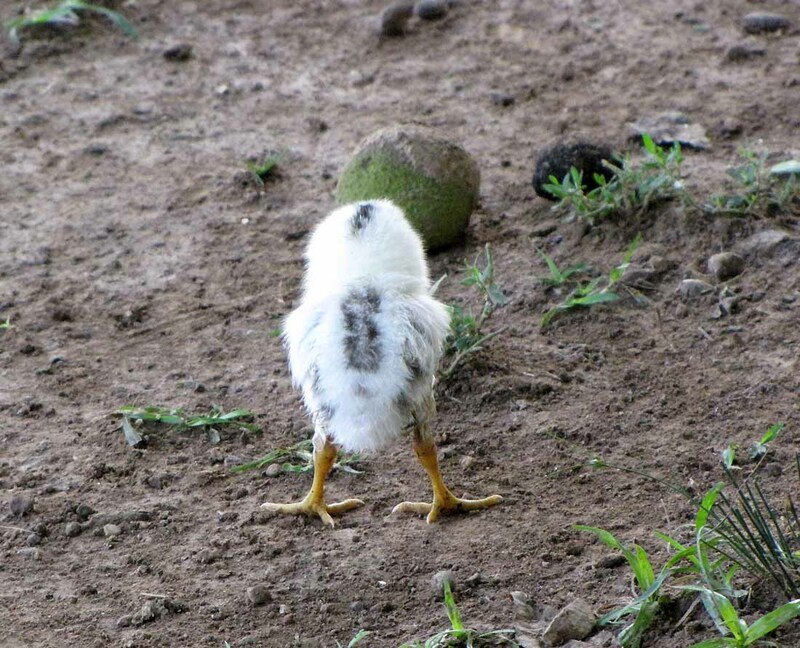 Now this one, I have NO doubt is a guinea keet. I’ve seen that coloration before. 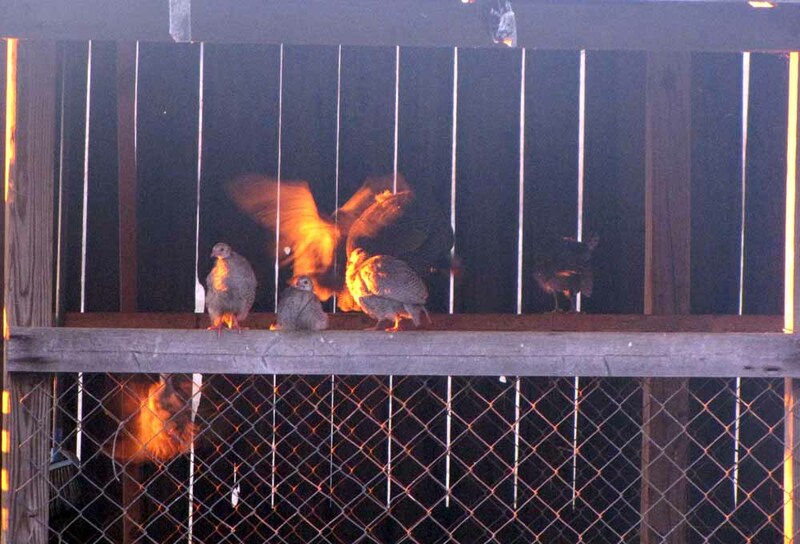 And even though the colors are different, you can see the same pattern on the head and neck as the brown keets. Toby thought it was fun looking for hidden keets, and spotted one of the brown ones for me. "Hey Mom, I found another one!" You can see the same stripe pattern on the “regular” looking keet’s head as is on the light gray one. 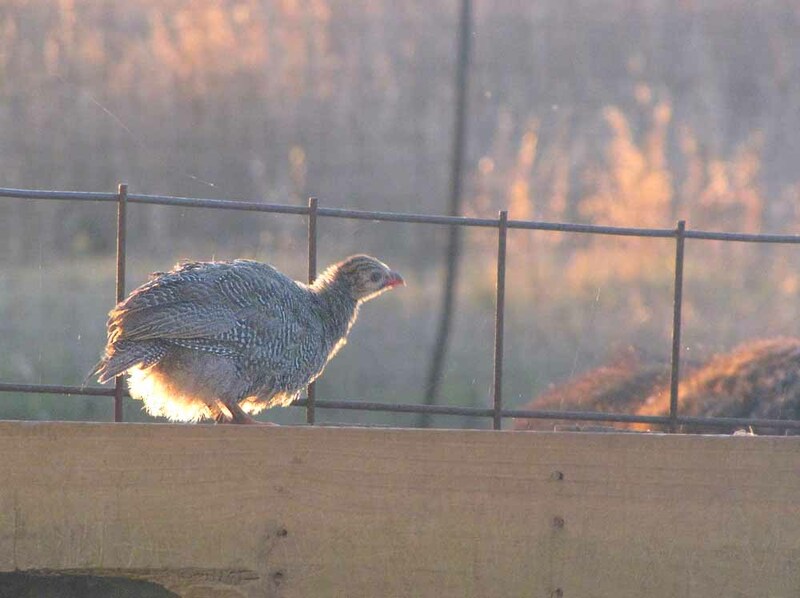 The usual brown and black marked guinea keet. 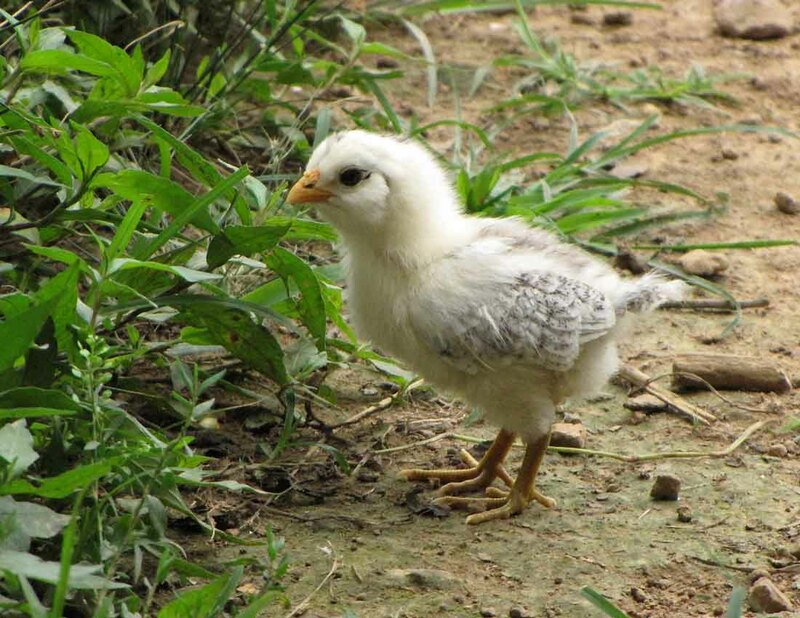 So while the jury is still out on our original “Chick-or-Keet”, this latest pale one is definitely a guinea baby. 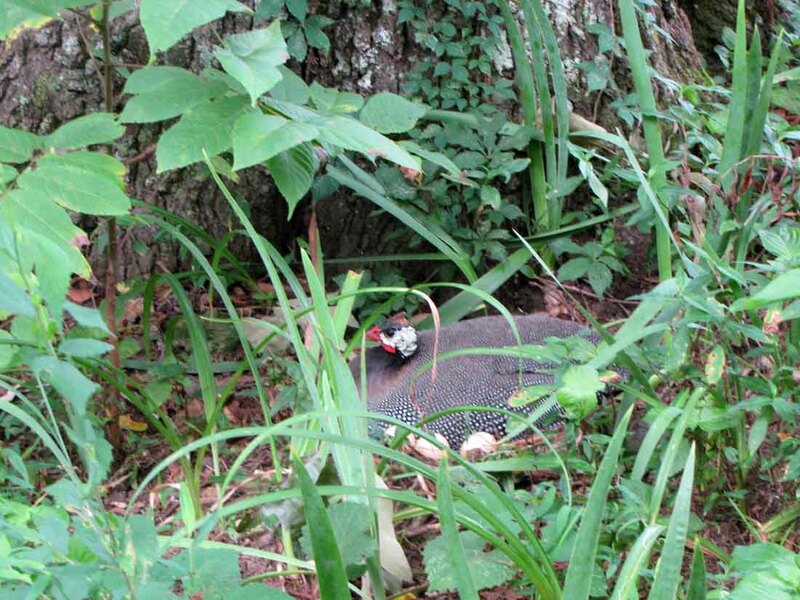 I know of at least one more nesting guinea besides this one! 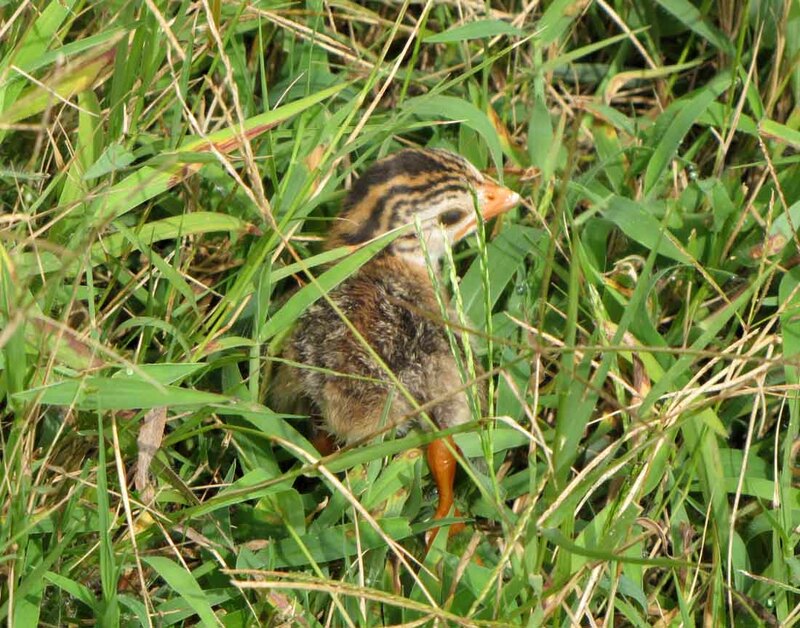 Stay tuned… there are still more guineas like the one above sitting on nests! Back In The HOT South. . . Yes, we’re home again! Back to heat in the high 90s… sigh…. Actually, we got home Tuesday night, but I’ve been trying to catch up a little on home and farm chores. When you’ve been gone for a week, it means you’re bringing home a bunch of laundry to wash for one thing! When I did chores yesterday morning, I noticed a few additions. 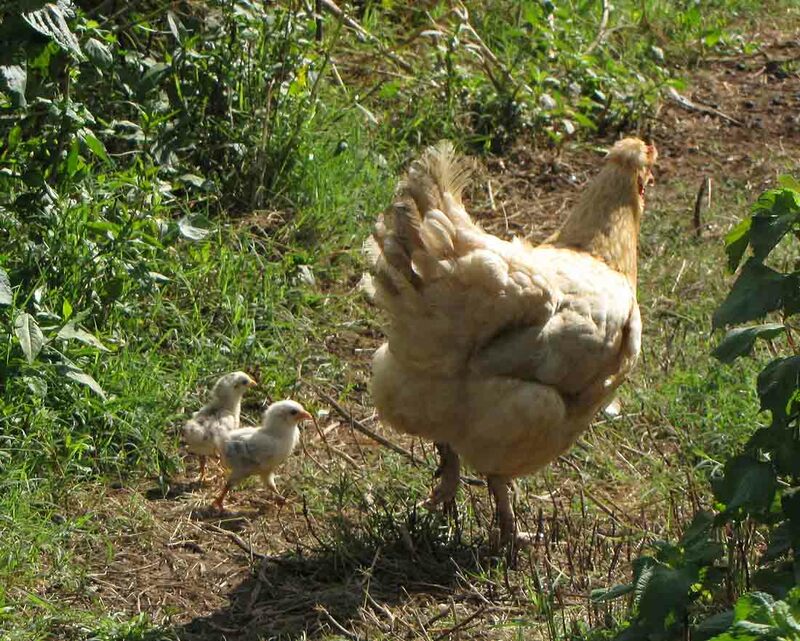 One hen has a couple of little chicks following her around now. She was sitting on a at least a dozen eggs, but I guess as soon as a couple hatched, she was out of there! And then I noticed this little fluff-ball. . .
At first I thought it was a little chick. Perhaps a little long-legged, but we get a lot of white chicks. It has some interesting dark markings on the back, however, so not totally white. Well now, THAT’s interesting! 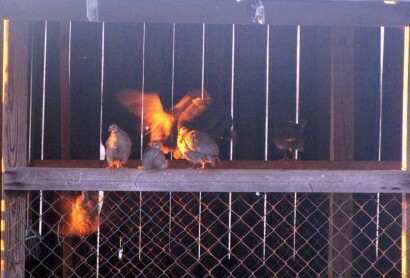 Our little guinea keets are usually brown and black. 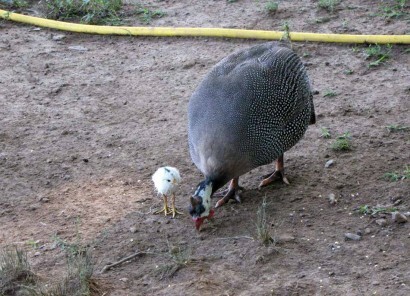 So the question is, did this guinea hen hatch out a chicken egg, or is this really a keet? At first I figured it to be a chicken, but now I’m not so sure. 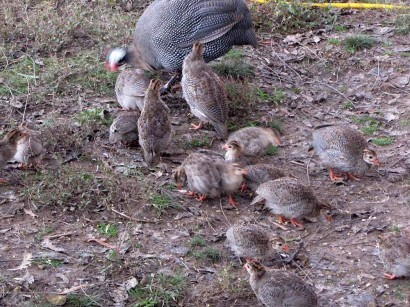 We had some white guinea fowl a few years ago, when we first got guineas. 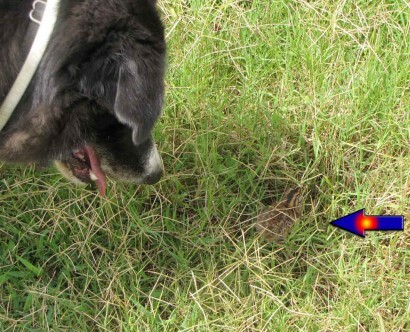 They didn’t last long, because the predators seem to find them too easily. But the genes are still floating around in the flock, so … maybe this is a for real keet. Guess we’ll know in a few weeks, if it survives long enough to feather out. I hope the adult guineas keep looking after this little baby. It’s a cute little thing. Every evening the guinea hens and guinea keets come in to get a little feed. 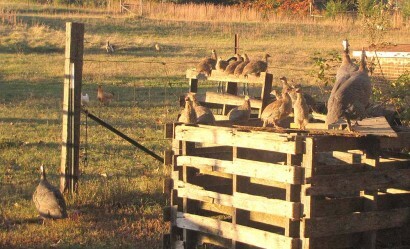 They’re generally waiting for me about sunset, perched on gates and pallets. As the light turns golden and night is coming on, there will be a BUNCH of them waiting for me. When they see me, they start fluttering their wings and getting ready to fly down off their perch. You can see one in the left front testing its wings (enlarge the picture and you can see it better!). 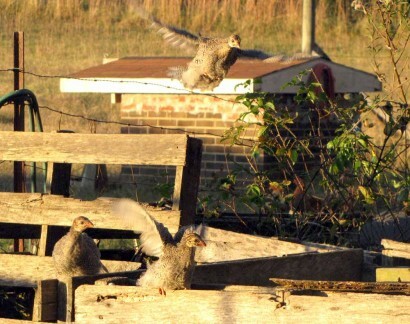 Pretty soon the guinea keets are taking that short flight down off their perches. 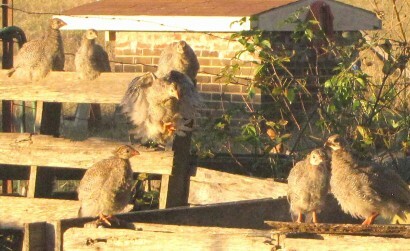 They sometimes do it in stages, from the highest perch to the next lower down, then onto the ground. More and more of them get into the act, cause they sure don’t want to get left behind! They’ll get their share of the cracked corn I’ve thrown out. 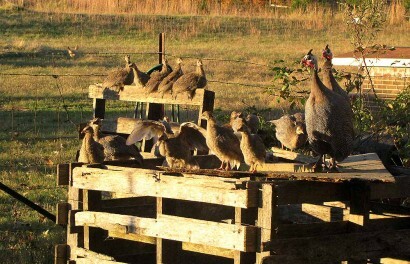 Then they’ll start another migration, looking for a place to roost for the night. 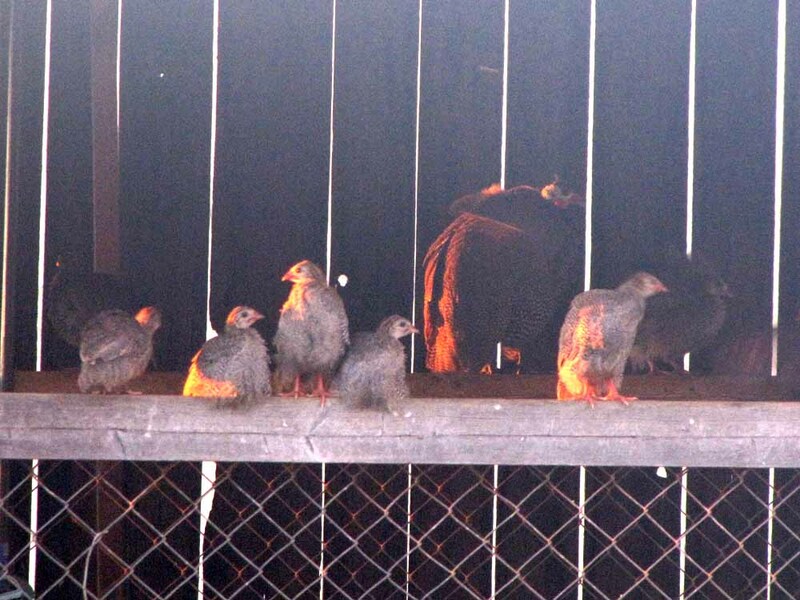 This bunch is roosting inside the sheep shed. Most of them ran under the gate, but this one decided to perch on top of the gate for a while. The sun was getting pretty low by the time they got in the shed to find their places. 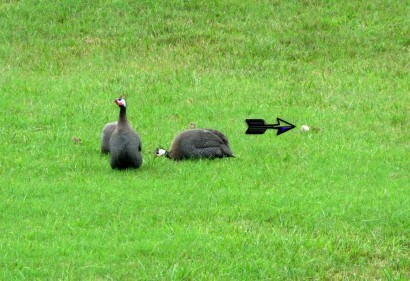 They flew up onto their favorite spot. The sun really glinted off the ones in flight. It didn’t take them long to get settled in and ready for the night. 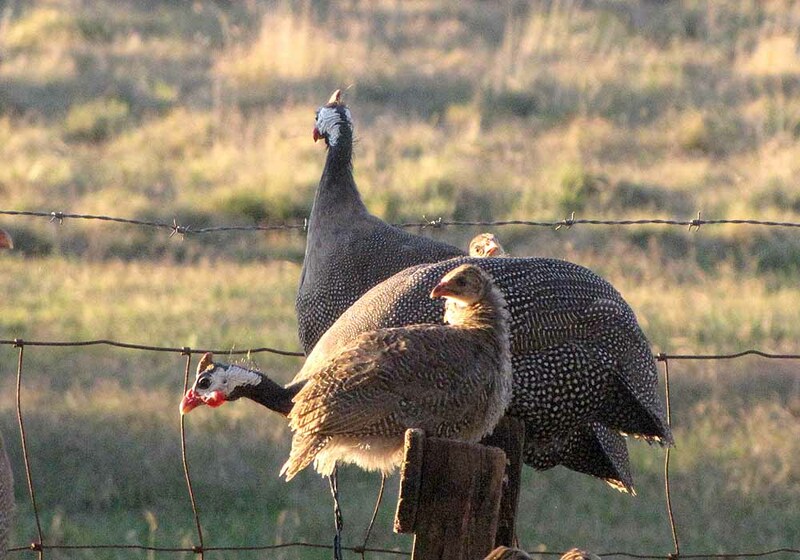 As the keets keep getting bigger, the guinea hens may decide to go back to roosting high up in the trees in the back yard. However, the sheep shed is a pretty good spot because our dogs don’t bother them, but they are smack dab in the middle of the area our Maremma LGD (livestock guardian dog) patrols at night. Than means they can sleep tight, and no predators bite.